We have been super excited to watch our asparagus patch finally yield us some delicious morsels. Asparagus takes several years before you can eat the stems, so when they started poking their heads out we were ready. Unfortunately, if you forget to pick them, the aspargus shoots grow very quickly and become woody. We’ve been enjoying dipping the stems into freshly boiled eggs, but I have been on the hunt for other ways to enjoy our Spring bounty. As I often do, I turned to Pinterest to find some inspiration. I’m not terribly good at following other peoples recipes (actually I’m hopeless! ), but I love a photo to give me the gist of what to make. I saw a pic of a phyllo tart with asparagus and tomatoes, and took it as my inspiration. Of course, we don’t have tomatoes at this time of year, so instead I used some mushrooms and some frozen peas. I think that the tart would also work well with some little fresh broad beans (just blanch and skin them first), or sliced snow peas. Use what ever Spring veg you can get your hands on. 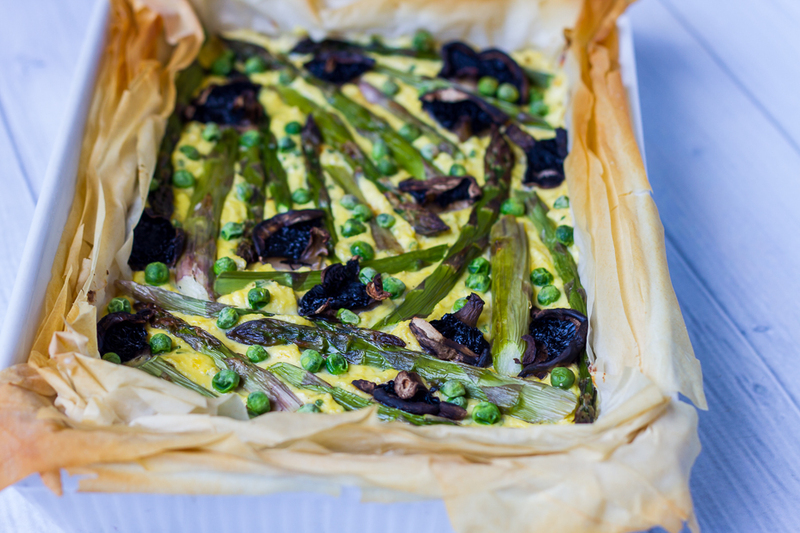 Place the asparagus and mushrooms on a tray and roast for 15 minutes or until softened slightly. Combine the parmesan, lemon zest, garlic, chives, ricotta, egg, juice of half the lemon, and season with salt and pepper. Grease an oven proof lasagna dish. Line the lasagna dish with a sheet of phyllo pastry. Brush a thin layer of olive oil over the phyllo in the lasagna dish. Place another sheet of phyllo over the top of the olive oil. Repeat layers of olive oil and pastry until all the pastry is used up. Spread the ricotta mixture over the base of the pastry. Cut the mushrooms into quarters and the asparagus into halves. Press the vegetables into the ricotta mixture. Bake for 25 minutes or until the pastry is golden and the ricotta mixture has set. 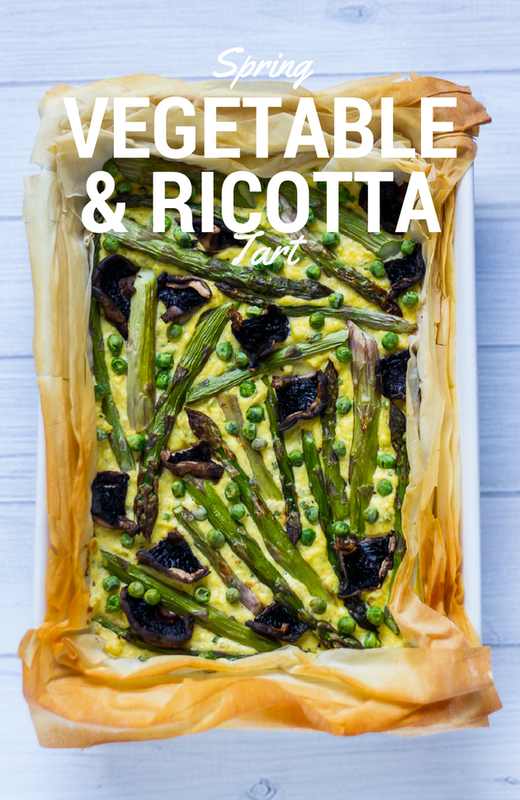 You could really make this with any Spring vegetables you have. Try snow peas, broad beans, beans, tomatoes, broccoli, or spinach instead. After a long winter full of hearty food, a lighter tart is perfect Spring fare. 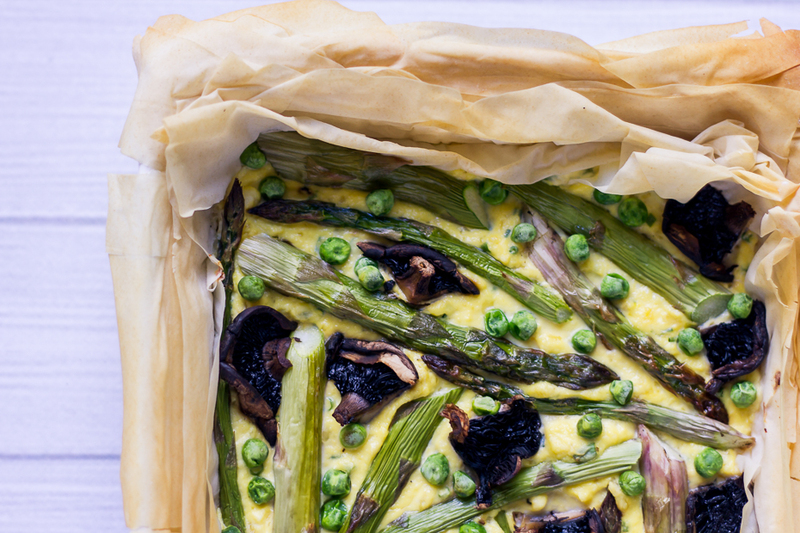 I suspect that we won’t get many more asparagus stems this season, so I’m filing this recipe away until next year. Do you love asparagus? Got any other delicious ways to eat it? Do you ever follow a recipe? gorgeous tart. perfect for spring and i love the lightness of filo! Y U M – this looks so pretty. I have a few asparagus recipes coming up on the blog shortly. Will definitely keep an eye out for them – heaven knows we still have heaps of them left. So pretty and looks delicious. I think I will have to arrange a ladies lunch just to have an excuse to make it! Thanks for sharing with YWF too.